Clermont Auvergne have been a very potent and visible force in French and European rugby over the last couple of years, and Irish fans will be very familiar with a number of their players. The Heineken Cup December double-header was a big hurdle on Leinster’s road to the trophy in 2010-11; the teams had met the season before that in a cracking quarter-final in the RDS as well. For two seasons previous to that, Clermont had been drawn in the same group as Munster, and there had been a number of high-octane and feisty matches between the two sides in Thomond Park and the Marcel Michelin. He’s a physically big man at 191cm [6’3”] and 105kg [16st2lbs], but it’s in combination with a speed, power and athleticism that very, very few rugby players that size possess. He’s also a genuine, technically good winger, at least in attack – he holds the ball in the correct hand, he’s got great body control near the line and he knows how to get over and dot it down any which way … he’s a proper finisher as well as a galaxy-class athlete. His old dad Kavekini Nalaga may have something to do with his good basics : he actually played for Fiji in the 1987 Rugby World Cup and scored a try against Argentina, but Naps has already far out-run his father’s achievements. 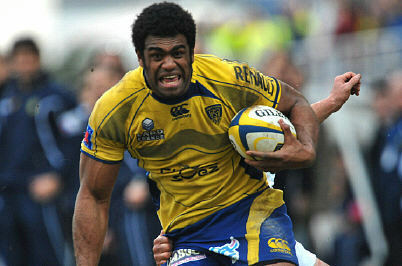 He was the Top 14 Player of the Year in 2009, running in a scarcely believable 20 tries in 19 appearances. It’s hardly a fluke, either: in his first season with ASM [07-08] he rattled the proverbial onion-bag 16 times, and after just three and a half seasons with that long-established and well-respected club he was their all-time record holder with sixty-one tries [51 in the Top 14, 10 in the HEC]. Whether it’s his tremendous handoff [or ‘raffut énorme’ as the commentary to this clip has it: http://www.youtube.com/watch?v=2fPvKXYZ2c4&feature=related] or his out-and-out speed [http://www.youtube.com/watch?v=CZdnIhf99G4&feature=related and http://www.youtube.com/watch?v=3QqrQQFI2rI&feature=related ] or his long reach and precision finishing, or his sheer explosive power, I’m not sure that, on his day, Nalaga isn’t the best winger in the world – including everyone. Fiji play so few internationals, and they are so irregularly broadcast, that world cups are really the only time you get to have a good look at some incredible talents at Test level. Last time out, I remember the openside Akapusi Qera being an absolute superstar, and indeed Fiji as a whole played cracking rugby and were involved in two of the best matches of the tournament, the group decider against Wales and the quarter-final against eventual winners South Africa. Nalaga isn’t coming into this world cup off a particularly good year, however. The poor lad has had huge difficulties in his personal life over the last year, and all sorts of stories came to public attention – that he was deeply depressed, that his fiancée had been badly injured in a car accident days before their wedding – whatever the story, he was supposed to be getting married in Fiji in November and then return to Clermont, but he simply never went back, and the club officially cut ties with him in the middle of March. He turned out for his old club Nadroga at the start of the summer and the Fijian rugby junta whipped him into the Pacific Nations Cup squad before he could get away … thank Jebus! The prospects of him facing up against Bryan Habana, Shane Williams, Alesana Tuilaga and Sailosi Tagicakibau in the group stages are absolutely mouth-watering. This entry was posted in One To Watch and tagged Clermont Auvergne, Fiji, Napolioni Nalaga, One To Watch by dementedmole. Bookmark the permalink.